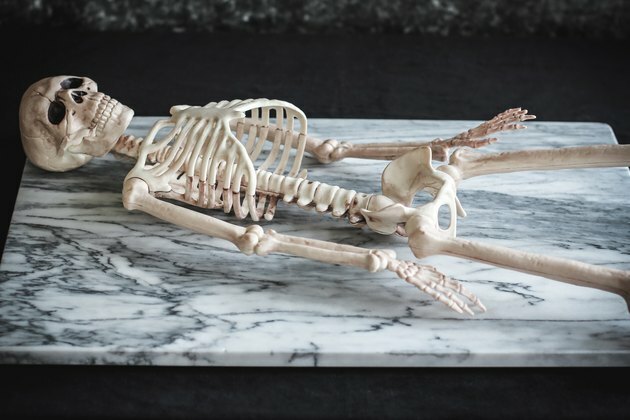 Mix fun and fright on your Halloween table by serving up spooky treats inside a skeleton prop. We went full-fledged with our candy charcuterie theme by featuring an abundant platter of desserts, but you could just as easily swap in savory items instead. 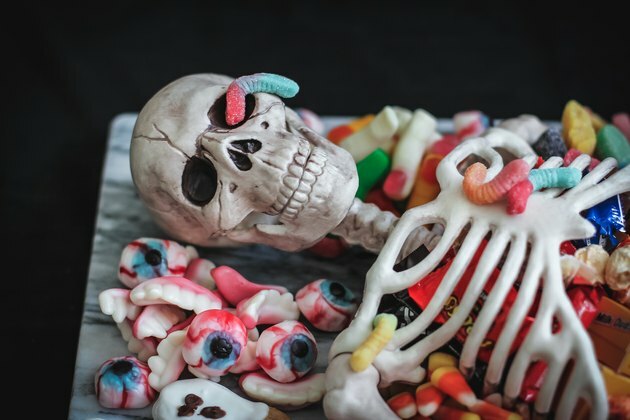 It's as easy as placing candy, cookies, caramel corn, and anything else you'd like on a plate–leaving you plenty of time to perfect your costume. Not only is this dessert a crowd-pleaser for both kids and adults, it also doubles as a festive centerpiece that is guaranteed to be the hit of your party. Assorted candies, cookies, desserts, etc. Before assembling your platter, be sure to thoroughly wash and dry the plastic skeleton with soap and water since you'll be serving food on it. Place the serving platter or board on the table where you plan to serve it, and place the skeleton on top of it. Position the skeleton so that the torso is in the center of the platter. 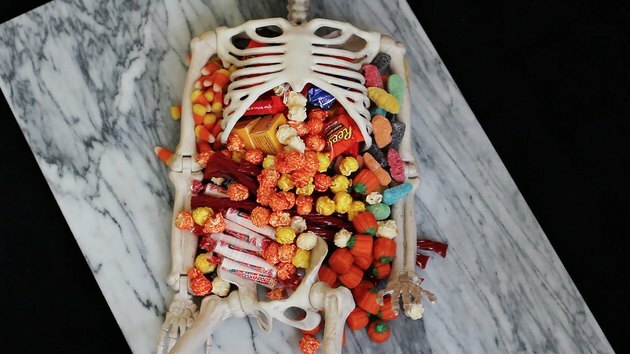 Fill the ribcage of the skeleton with candy, letting some of it spill out of the sides. 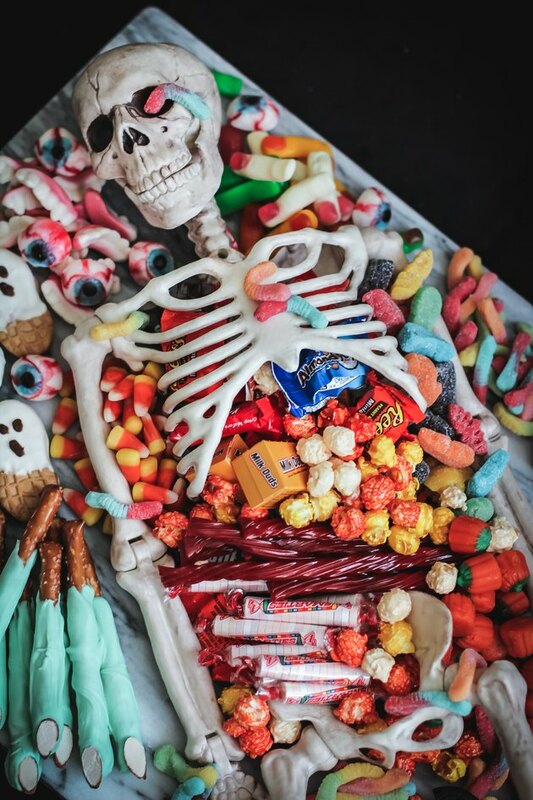 Pile more candy on top of the torso area, making sure to use a variety of different candy types. We used assorted fun-size candy bars, smarties, and red licorice. 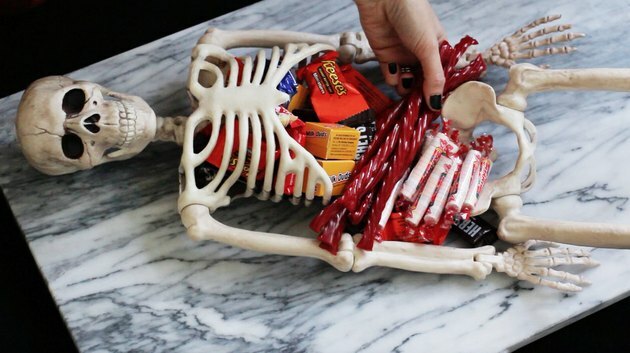 Fill the crevices between the arm bones and torso with different types of candy. 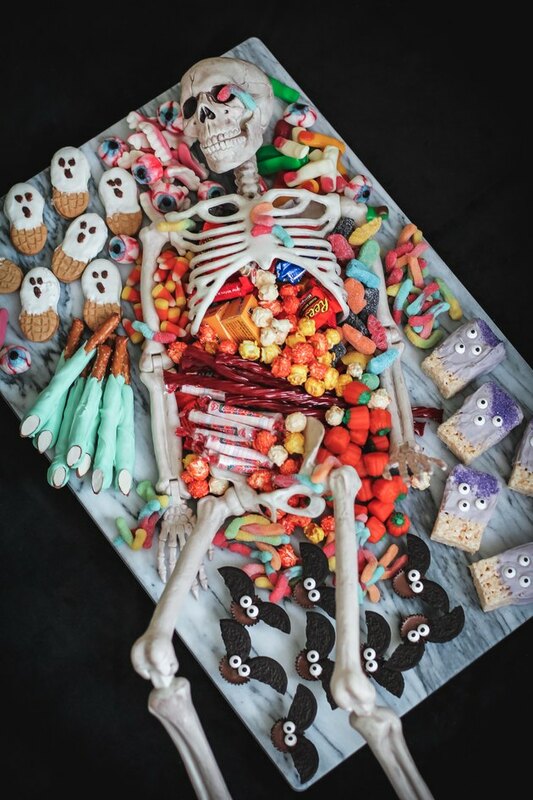 Be sure to vary the colors and textures of the candy for a more visually appealing platter, and pile it high so that it appears to overflow out of the skeleton. We're going for abundance here. We used candy corn, sour gummy bats, candy pumpkins and caramel corn. 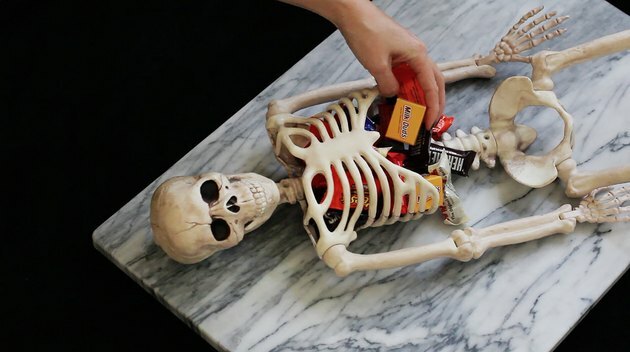 Place larger treats around the edge of the platter to fill in the areas around the skeleton. For the ghosts, we simply dipped Nutter Butter cookies into white candy melts and drew eyes and mouths on them with melted chocolate. 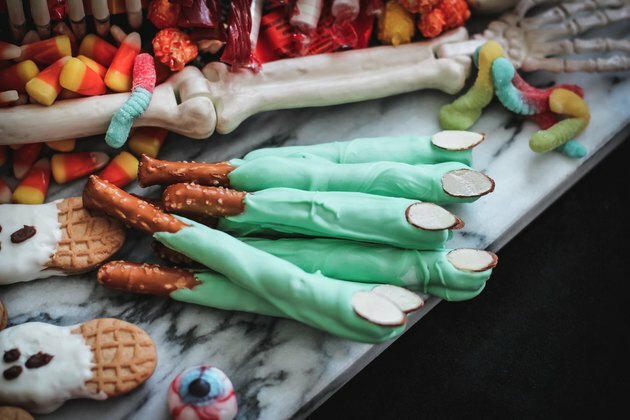 For the witch's fingers, we dipped pretzel rods into green candy melts and added a sliced almond "fingernail" at the tip. 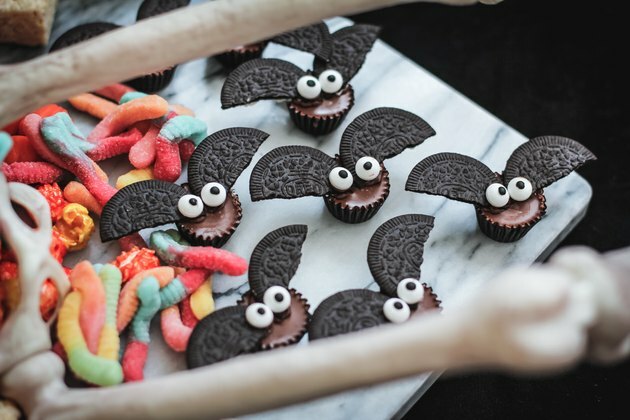 For the bats, we took apart Oreo Thins, broke the wafers in half, and used melted chocolate to secure two "wings" to each Reese's peanut butter cup. We then secured googly eyes to the center with melted chocolate. 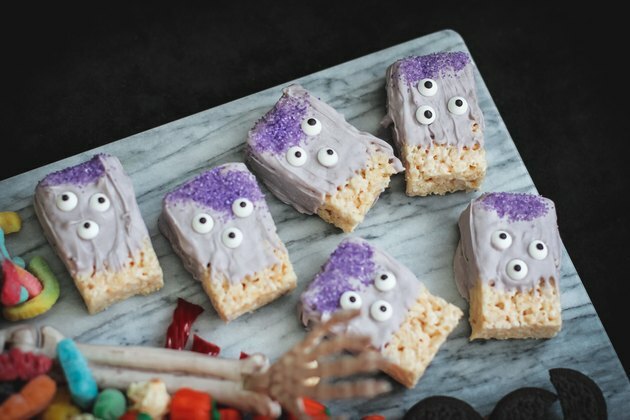 For the three-eyed monsters, we dipped rice krispie treats into purple candy melts, added three googly eyes to each, and dusted the tops with purple sugar to create "hair." 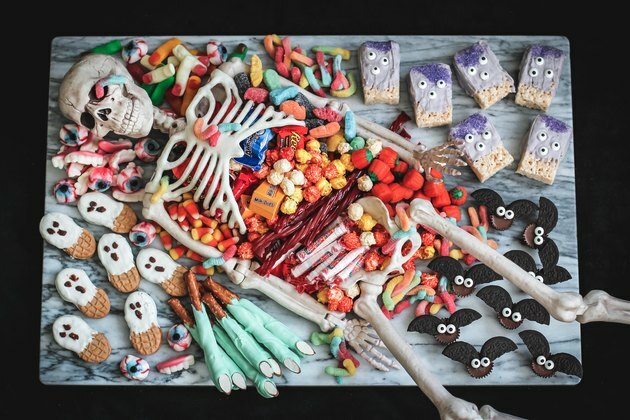 For a spooktacular touch, garnish the platter with an assortment of creepy candy. We filled in any remaining empty spots with gummy eyeballs, bloody fingers, vampire fangs, and a few strategically placed gummy worms. 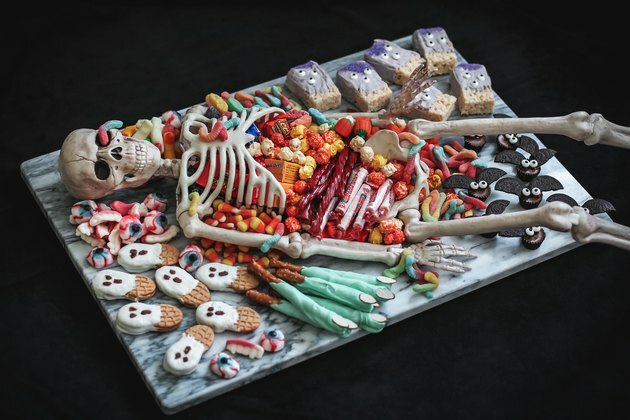 Sweet and spooky, this skeleton dessert platter is bound to bewitch all of your party guests.